AP EAMCET Counselling 2018 Schedule will be announced soon after the declaration of the EAMCET Results. Many students are curious to know the dates of AP EAMCET Counselling 2018. In this article we are going to give the information regarding the AP EAMCET Counselling Procedure. Candidates can also check the AP EAMCET Counselling 2018 dates in the official website too. 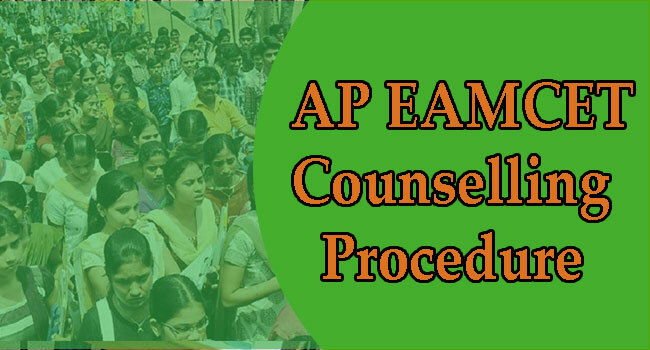 Candidates who are qualified in the AP EAMCET 2018 are allowed for the AP EAMCET Counselling 2018. Candidates who wish to attend for the AP EAMCET Counselling 2018 need to pay the Counselling fee through online mode .The Counselling fee need to be paid before proceeding for the Counselling session. Board Name Andhra Pradesh Board of Intermediate Education. Name of the Exam AP EAMCET. Organizing University Jawaharlal Nehru Technological University, Kakinada. Category AP EAMCET 2018 Counselling. Rank wise Counselling Dates June 2018. Candidate can use any mode- credit card, debit card or net banking to make payment. Payment receipt will appear on the screen. The Counselling fee for General/OBC candidates is Rs 1200. The Counselling Fee for SC/ST candidates is Rs 600. Your fee receipt contains registration id & password card. By using these credentials, you can Login to the Web counselling assigned URL. That website contains the Branch wise vacancies and College wise branch vacancies list. Choose your preferable branch & college according to your rank. After some days you will receive seat allotment order details at your registered mobile number by SMS. AP EAMCET 2018 Hall Ticket. S.C or its equivalent Marks memo. AP EAMCET 2018 Rank Card. Caste Certificate issued by the competent authority in case of reserved category candidates (BC/SC/ST).